To learn more about the features of each type of mattress cover, just click on the product's tab above. Can't see your model of Bailey caravan? Then please contact us on 01929 471403 or use the Contact us form as we can supply bedding of all shapes and sizes to fit your Bailey caravan. 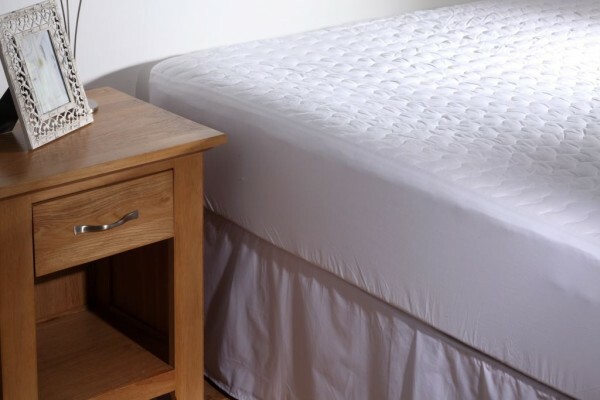 The fixed bed Ripple Mattress Protector is perfect for adding luxury to your touring Bailey Unicorn Caravan. This product is at the top of our mattress cover range available in special sizes to fit your caravan. Filled with 500 grams of soft cotton layers, makes this mattress protector pure luxury. It has a Ripple stitching design, which also ensures the filling stays evenly placed. Being 100% natural, it allows moisture through to keep you cool and comfortable throughout the night creating that luxury sleeping experience whilst touring in your Bailey Unicorn Caravan! A proven winner, this is one our most popular mattress covers, a beautifully padded mattress cover with a satin stripe design top with diamond stiched quilting. 200 Thread Count Polycotton Percale Satin Stripe Cover. Quilted construction to keep filling evenly in place. Available for Bailey Unicorn Valencia, Cadiz, Barcelona , Cartagena, Vigo & Cordoba. Every bed in every home really does need a mattress cover including your home away from home Bailey Caravan. Our super deluxe quilted mattress cover has been made to the highest standards, specially made to fit your touring bailey Unicorn Caravan with fully elasticated sides and a quilted construction to keep filling evenly in placed after many washes. Our luxury quilted waterproof mattress cover has been made to the highest standards, specially made to fit your touring Bailey Unicorn Caravan fixed Bed with fully elasticated sides and a quilted construction to keep filling evenly in placed after many washes.with its waterproof backing, its sure to keep to your caravan mattress in great condition. If you cannot see your caravan listed above, please do contact us as we can supply for all shapes / sizes to fit your caravan beds. Click the button below to add the Bailey Unicorn Caravan Fixed Bed Mattress Protectors to your wish list.